Charlie Chaplin: What Was He Thinking?! Have you ever seen a Charlie Chaplin film projected, with an audience? I’m always surprised to find out how few have. It’s magical, a communal experience with everyone bonding via laughter. Not only will you enjoy yourself, I guarantee that at some point during the screening you’ll make a mental list of loved ones you wish could be there with you. It’s the most amazing side effect, craving to share your joy with others. My God, what could be a better feeling to have when seeing a film? 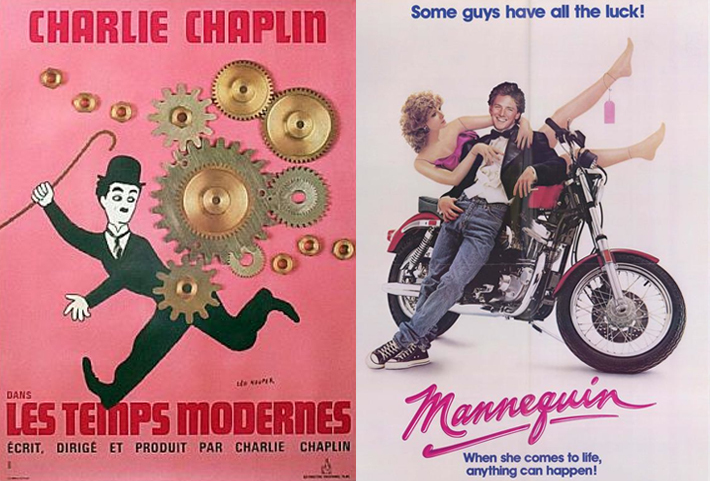 In 1942, Charlie Chaplin, 52, was caving to artistic insecurity. Virtually a Luddite when it came to talking pictures, his three features made during the Sound Era were either completely or mostly silent (he composed music but there was very little synchronized sound for the dialog). Like any performer who made a cultural impact, he feared two kinds of mortality: his own death and the death of his body of work. In an effort to keep up with the times, he modernized The Gold Rush for contemporary audiences. Drastically. Obviously, Chaplin added music (again, his own compositions) and sound effects and seized the opportunity to tighten the plot some, removing a subplot. So far, so good. Logical. Also, he changed the film’s ending, which I think was a big mistake. Without giving anything away, I’ll just say that he altered the film’s conclusion to be something more chaste but less satisfying. Did you cringe? I did the first time I saw the 1942 version (I was already familiar with the silent version). I looked around me as if someone in the audience were rudely speaking. Chaplin’s voice and demeanor is, frankly, condescending (“The Little Fellow”!) and clashes with the action on the screen. He sounds like a loud mime.1 His insecurities as an aging artist get the best of him and he spoon-feeds us set-ups and occasionally punchlines. Likewise, his music spells out every gag (his music is an acquired taste, to say the least). The obvious comparison is George Lucas’s infamous alterations to the first three Star Wars films, when he “spiced up” his films for a contemporary audience. And it’s a perfect way to defend Chaplin’s actions since they bear little resemblance to Lucas’s. For starters, Chaplin was a relic from the Silent Era and had become fearful that the bulk of his work would be forgotten completely. Film preservation wasn’t in style at the time (it wouldn’t be for decades), and he had seen the work of his peers literally disappear. (If Lucas seriously thinks his films will disappear or become obsolete, he’s an idiot.) 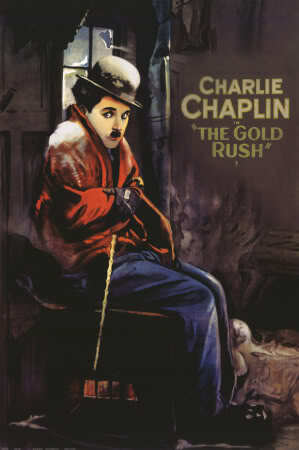 And so Chaplin approached The Gold Rush with the logical notion not to preserve but to allow rediscovery. Unfortunately, he doubted the new audience’s ability to comprehend his brilliant mimicry, which is truly sad. I guess when you add Ego, Age, Insecurity and Power, you get, well, the Loudest Silent Film Ever. This is a part of the reissue's opening credits, the writing on the wall, so to speak. To this day, the 1942 version is the one most readily available, at least the best- looking one. (In fact, to many of you reading, that may be the only version you know.) In 1953, the original version fell into the public domain in the US, so copies of that could be had on film and video, but always in less-than-reputable versions. Finally, in 2003, a 2-disc set was released which included both versions, though the 1942 version is the one presented front-and-center. Sadly, for reasons that I’m sure are buried deep in one of Chaplin’s contracts, the new 35mm print at Film Forum is the 1942 version of the film, which makes me wonder when (or if) a new print of the original version of the film will be available. Like his other films from the Silent Era, The Gold Rush should be seen projected, with an adoring and receptive audience. It’s magical. But what’s screening tonight is a drag. So, let’s call this post a PSA. 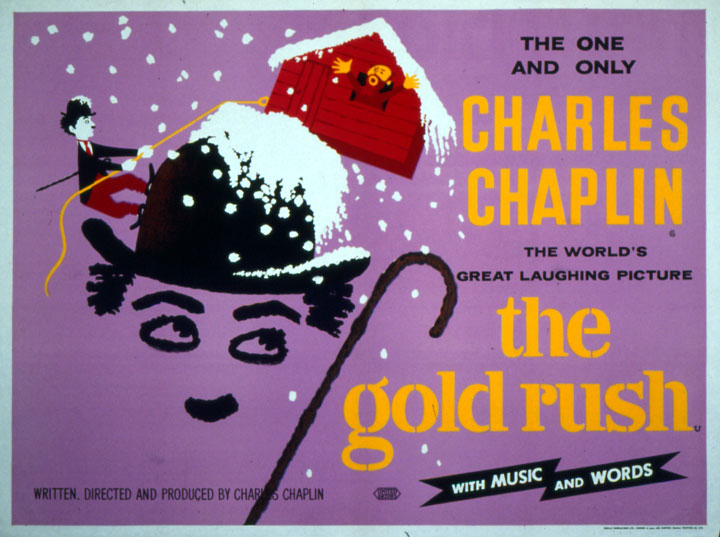 If The Gold Rush is ever screening in your neighborhood, be sure to find out what version it is, or else you’ll find yourself yelling, “Shhhhh!” at the screen. The reissue's poster. Notice the tell-tale caption: "With Music and Words." BACK TO POST 1 In the early 70s when Albert Brooks was doing stand up comedy, he did a bit on The Tonight Show as a French mime who spoke during his act: “Now I am walking against zee wind!…Now I am climbing zee rope!” That’s what I think of when I watch the 1942 version of The Gold Rush. And when you’re watching Chaplin, you don’t think of another comic. Sacrilege!